Best Chinese Knives: Sanrenmu 7094 LTX Review - Good budget SAK Alternative! Sanrenmu 7094 LTX Review - Good budget SAK Alternative! It arrived in a branded thin cardboard box, without any issues - all blades were centered, no bladeplay on the locking tools (blade and saw), main blade was very sharp. - Good execution, fit and finish. All works exactly how it should. The thing that did surprise me for the best was the smoothness in the deployment of the main blade (runs on washers) using both methods (flipper and thumb stud). - The design. It is stated on the blade that it is designed by WindRunner and it is pretty clear that someone who knows something about design had something to do with this knife. First of all I liked the concept - a multi-tool style knife, but with an appealing (and not pen like SAK style blades) and locking blade, locking saw and a glass-breaker at the tip. In addition, the black parts of the handle are rubberized and provide additional grip. - The tool selection is also pretty good - main blade, saw, cutting hook + Philips head, bottle opener + flat head and a glass breaker at the tip, most of the usable stuff. - This knife is pretty compact and feels too small for my medium sized hand, but it will probably be a great fit for a smaller (or a child's) hand. 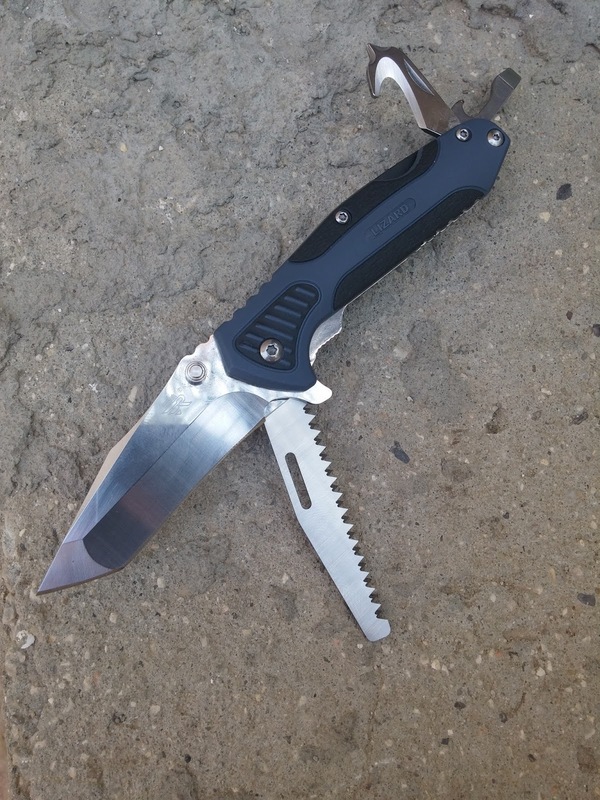 - The knife has a pocket clip but it is tip down only. - The Philips head screwdriver is not of the best quality and the saw couldn't be pulled out with 1 hand. - This tool is really well made and designed for the price (despite the pretty small drawbacks) and would be a great alternative to a Swiss Army Knife, especially when looking for a compact budget user option for people with small hands. It will also suit children or teenagers who are in the Scouts or they are doing any other outdoor activity, because of the size of the handle and because of the locking tools. I wish I had a knife like this when I was growing up.